You may remember wonton wrappers being used as fresh pasta in our vegetable lasagna recipe. Once again they work overtime by saving you money and giving the appearance of many hours slaved away over a pasta maker, turning out fresh noodles for your dinner companion. For a delicious BrokeAss appetizer, try boiling the raviolis, lightly pan-frying them in olive oil, and serving the marinara on the side as a dipping sauce. 3/4 cup ricotta cheese $4 for 15 oz. Heat the olive oil in a small saucepan over medium heat. Add half of the garlic and cook for 1 minute. Add the tomatoes, salt and pepper to taste, half of the basil and 1 cup water. Stir well and cover. Reduce heat to a simmer and allow to cook for 25 minutes. While the sauce cooks, make the ravioli. Break the sausages into 2" chunks and place in a food processor or blender along with the remaining basil and garlic, the ricotta, and salt and pepper to taste. Pulse until well-incorporated (should resemble a thick paste). To assemble the raviolis, lay one wonton wrapper on a clean, dry surface. place about 1.5 tbsp in the center of the wonton wrapper. Using a pastry brush or a clean finger, wet the edges of the wrapper with water and cover with a second wonton wrapper. Press the edges to seal and transfer to a large plate. Repeat until you have used up all the filling (you should have about 16 large raviolis. Bring a large pot of salted water to a light boil. Cook 3-4 raviolis at a time just until they float to the surface (should take no more than a minute). Remove with a slotted spoon and transfer to a clean plate. Repeat until all have been cooked. To serve, divide the freshly-cooked ravioli between 2 plates or bowls and top with the fresh marinara sauce, more basil and freshly cracked pepper. This dinner was DELICIOUS. It was also shockingly easy to make. Using the wonton wrappers instead of making pasta dough was not only fast, but completely delicious. Less than 30 minutes and dinner was ready . . . can’t beat that! 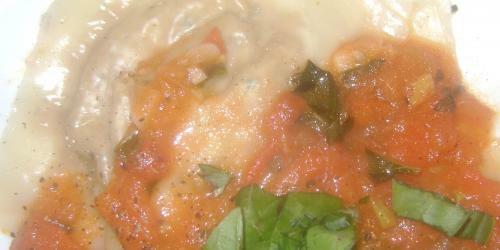 I was lucky enough to sample these ravioli and they are AMAZING. I will be making these immediately – if not sooner. Awsome idea using won-ton wrappers – never thought about it as the texture is so different. Love the idea, I will be making these with some friends this sunday night – I’ll I needed was a quick prepare so I can show their son how to do this for himself. Sweet thanks for the creativity. Why do we even talk about it? This website is helping me to think about https://research-paper-writing-online.blogspot.com/ more and to do something that I’ve never done. You just simply give it a go without giving it a lot of thought. This is an amazing recipe and I really enjoy it. I made it several times and everytime I eat it, the only word out of my mouth is “delicious”. The importance of blog writing has expanded in leaps as well as bounds in the current years. There are several people in various nations around the world that are carefully involved in blog writing and are always anxious to recognize a few outstanding blog post tips in order to raise their salability.